I recently returned from a magical week sailing the turquoise seas of south-west Turkey, leaving behind the cosmopolitan port of Bodrum to discover hidden coves and pretty harbours. As I write this – almost a month later – barricades are being set up on the streets of Istanbul. Does that mean that travel to Turkey is now a risk? Not according to the Foreign Office which only advises “British nationals to avoid all demonstrations”. As before, there are certain parts of the country it suggests you don’t visit, including the border with Syria. Unsurprisingly. But there’s no reason not to book a holiday in Turkey this summer, particularly if you are heading for the coast. In fact, Bodrum is 500 miles and 11 hours by road from Istanbul, further than London is from Cologne. To stay away from this beautiful and enchanting country because of security fears would be a gross error, and could have damaging effects on its people, many of whom rely on the tourist industry for their living. If my experience was anything to go by, you won’t find any tension on the streets of Bodrum, and things will get even more idyllic when you set sail across the sparkling Aegean. I joined a group of friends to charter a 25m-long wooden yacht, Nemesis, sailing the waters around the Bodrum Peninsula and Datca Peninsula, surely one of the most beautiful and least-spoiled coastlines in this part of the world. We were joined by Loes Douze, the founder of SCIC Sailing, which is based in the Netherlands and operates just four yachts in the region, including ours. She claims to offer something different to the many local yachting companies, including a truly international clientele: most of her customers hail from Holland, the UK, Scandinavia, South Africa and Canada. 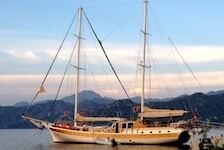 She also promises flexibility, freedom and the chance to travel under sail. “Most companies have fixed itineraries, so to get from one harbour to the next they can’t rely on the wind. They need to turn on the motor. 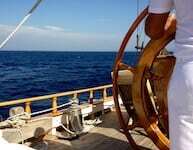 In fact, some crews don’t even know how to sail,” Loes explains. I certainly did. 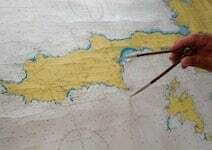 Each morning, our captain, Selo, who has worked with Loes for the past 20 years, would gather all the passengers to pore over the charts, and he would propose a route for the day. Before sunset we would find ourselves either moored up in a pretty harbour, or in a deserted bay where we could swim in the limpid waters before dinner was served on deck. There were few objections. Another thing that makes SCIC (pronounced “chic”) unique is that Loes personally puts together the groups, and even offers a sort of platonic matchmaking service. If you try to book a week and she doesn’t feel you’d enjoy the company, she will suggest an alternative. Really? She turns away paying customers? “I had a pair of ladies who were very specific about where they wanted to go – they wanted to drink at a bar every night. I told them we don’t work like that. I don’t know where the boat will end up each day,” says Loes. That serendipity was certainly a part of the charm. But so was the yacht itself: all polished wood, classic curves, groaning timbers and flapping sails. The cabins were small (although each had an ensuite bathroom) and the water in the shower wasn’t always piping hot, but there were plenty of sunbeds and comfortable chairs on deck. I only ever used my quarters for changing and sleeping. At the end of the first day at sea we weighed anchor in an idyllic bay of crystalline water, framed by steep green hillsides that glowed crimson in the dying sunlight. We swam, ate a dinner of squid and sea bass, then watched a velvety black sky shimmer with stars. The food was excellent throughout. Nothing flashy, just classic Turkish dishes and salads, all fresh local ingredients, expertly cooked. One day we visited the village of Bozburun for the weekly market. This isn’t aimed at tourists – rather than fake Gucci handbags, you’ll find vegetables, household goods and light farming equipment. While the crew stocked up on fresh food, we bought dried cranberries, spices and nuts, all for pennies. 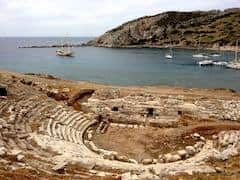 On another day we visited Cnidos, an ancient and abandoned city with a 5,000-seat amphitheatre set in a steep hillside overlooking a natural harbour. The road to Cnidos is treacherous, but arriving by yacht is a breeze. And the place was almost deserted. Every year 3 million visit Ephesus, Turkey’s most famous ancient site. Cnidos, by contrast, gets just 15,000 annual visitors. Towards the end of the week, the crew moored the yacht at a quiet bay and set up a barbecue on the shingle beach. We enjoyed a torchlit dinner of skewered meats and mezes, gazing back at the shimmering lights on the yacht. It was perfectly quiet, completely idyllic, with little to tell us that we were in the 20th Century, let alone the 21st. So here’s what I think. 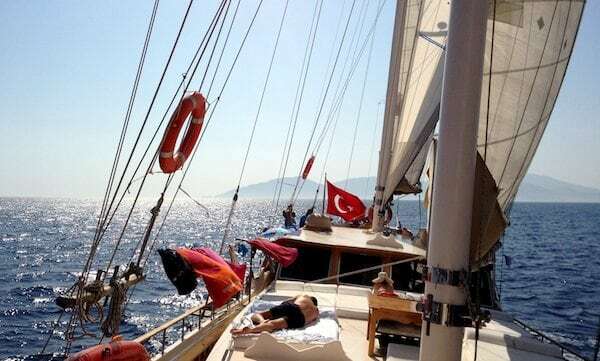 If you’re looking for a relaxing, slow-paced yet sociable holiday – and your idea of luxury is simple fresh food and idyllic settings, rather than five-star bells and whistles – sailing in Turkey might just be for you. * A week’s sailing with SCIC Sailing costs from €899 (£770) to €1,013 (£867) per week including breakfast, lunch, five dinners and all drinks including alcohol. EasyJet flies to Bodrum from Gatwick and Stansted – my flight cost me £250 return. Airport transfers can be arranged on request. ** Turkey specialist tour operators recommended by 101 Holidays include Cachet Travel and Peter Sommer Travel.